Tacodeli, Austin’s best little authentic taqueria boasting a menu of more than 40 made-from-scratch tacos, is expanding, with two new bricks-and-mortar locations. Located in the Crestview neighborhood at 7301 Burnet Road, and in the Village at Westlake shopping center at 701 S. Capital of Texas Hwy., the new Tacodeli locations are scheduled to open in the first quarter of 2014. Representing Tacodeli’s foray into Austin neighborhoods where many of the taqueria’s loyal patrons live and work, the new restaurant locations will be between 2,200 and 2,400 square feet, include plenty of patio seating, feature Tacodeli’s award-winning breakfast, lunch and daily specials menu, and embody the welcoming, lively surroundings the Tacodeli brand is known for while also reflecting the sensibility of each neighborhood. Tacodeli owners Roberto Espinosa and Eric Wilkerson are working with acclaimed interior designer Joel Mozersky to modernize the style of the new locations. Each location will be staffed by at least 30 employees, many of whom will be promoted from the company’s three other bricks-and-mortar locations. The well-loved, iconic restaurant concept that got its beginning in 1999, when the first location opened on Spyglass Drive, and Tacodeli is now ripe for growth. Inspired by delicious food memories from his childhood in Mexico City, Espinosa opened Tacodeli 14 years ago, with Wilkerson coming on board soon after. But Tacodeli has come a long way since the days when Wilkerson and Espinosa towed a trailer by bicycle advertising Tacodeli tacos next to MoPac Expressway during morning rush hour. Indeed, for the past year and a half, Wilkerson, Espinosa and their dedicated team of Tacodeli decision-makers have been on the hunt for the ideal Tacodeli locations, and have been building up the business’ back-office capabilities, adding training systems and restaurant-management systems to help ensure that the company’s infrastructure is scalable and can support more rapid growth. 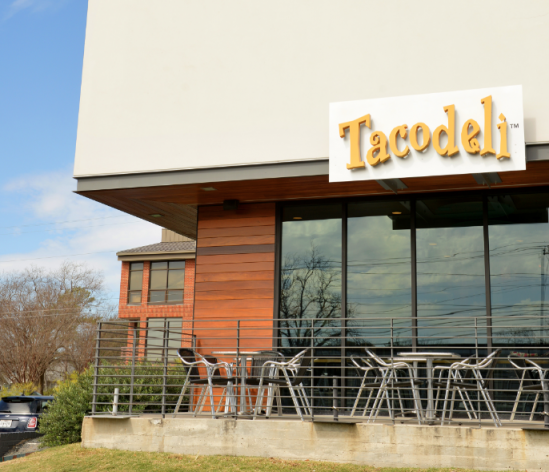 With the opening of the new Crestview and Village at Westlake locations, Tacodeli will continue to offer catering services and feature its tacos at a variety of coffeehouses throughout Austin. With the addition of always evolving daily specials, Tacodeli will continue to feature a chef-driven menu of popular breakfast tacos, savory taco lunch favorites, vegetarian and seafood tacos, authentic soups, salads and sides — all made from scratch with fresh ingredients, many of which are organic and locally sourced. Tacodeli has been cooking up the best tacos in Austin since 1999. In addition to the new locations at 7301 Burnet Road and 701 S. Capital of Texas Hwy., Tacodeli has three other locations: 12001 Burnet Road in North Austin, 4200 N. Lamar in Central Austin, and the original location at 1500 Spyglass Dr. in South Austin. For more information about the new Tacodeli locations, call (512) 732-0303, email info@tacodeli.com or visit www.Tacodeli.com.